When visualizing Toronto, Ontario you may think of the Hockey Hall of Fame, St. Lawrence Market, and the Steam Whistle Brewery. All three are great places to visit during the day, but in the evening, don’t forget to reserve your table at the CN Towers 360 Revolving.Last week Tastebud B and myself took a trip with friends to visit our neighbors to the north. We spent most of our trip in the beautiful city of Toronto, Ontario. 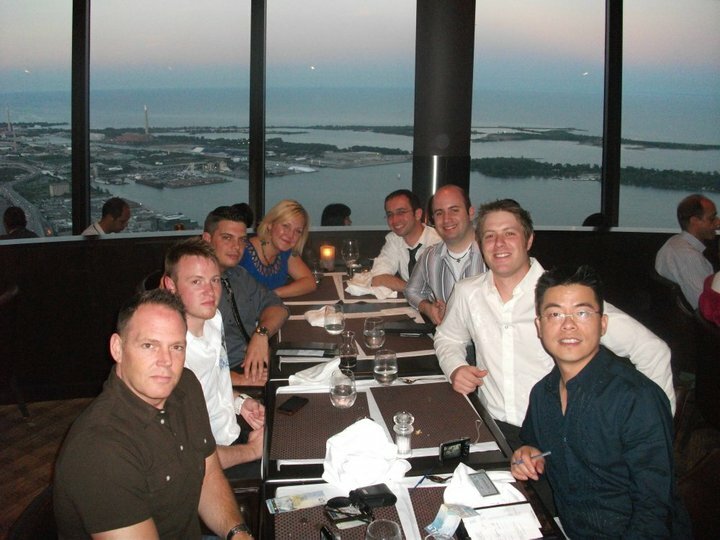 On one evening a friend made reservations for the whole group at the CN Towers 360 Revolving and we knew this would be the perfect chance to expand our website and experiences with our readers and fans. I have to start off by saying that this is an amazing experience. The view is breathtaking, the menu has plenty of options, and the service is on key. It is a place to celebrate a birthday, anniversary, romantic night out, or to enjoy good times with friends. And with a “smart casual” dress code you can’t go wrong with dress jeans and nice shirt or suit and tie. Now time for the good stuff…the food! I went with the Prix Fixe menu. The options for this were fun and exciting and it was easier on the credit card as well than ordering for the regular menu. Plus, by doing this, it left open the cash flow to order wine or a special drink. Below is a picture of all of us. Check out the view! Remember, it does revolve, so your view slowly changes so you get the lake and city.